SAN JOSE, CA--(Marketwire - October 22, 2009) - Beginning Monday, Dolce Hotels and Resorts will invite its Facebook fans to propose dream vacations at the Dolce Hayes Mansion with the promise that the fan whose idea gets the most votes will be awarded their own vacation. 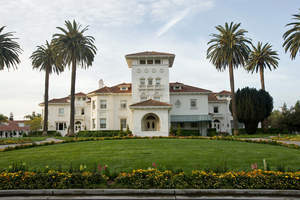 To enter the contest, called "Tell Us Your Story," Dolce's Facebook fans will be asked to study the culinary, recreational and relaxation attributes of Dolce Hayes Mansion, a century-old hotel, resort and spa here that once was a lavish private estate and now is considered one of the South Bay's most distinctive historical structures. Then they will create a personal vacation plan for taking full advantage of the 214-room hotel's facilities for their vacations, including its two restaurants, lounge, day spa, fitness center, outdoor pool and tennis courts. Dolce executives will select 20 finalists and post them on Facebook where Dolce's fans can vote for their favorite. Grand prize will be the very vacation package created by the winner, a value of up to $4,000. Deadline for submissions is Nov. 13, finalists will be announced Nov. 15, voting will be held Nov. 16-20 and the winner announced Nov. 23. "Given our location in the Silicon Valley, it's only appropriate that Dolce Hayes Mansion serve as a pioneer utilizing the social media for marketing," said Cedric Fasbender, Dolce Hayes Mansion general manager, who also serves Dolce Hotels and Resorts as regional vice president. "We're encouraging our Facebook fans to tell their friends about the contest." Complete details will be listed Oct. 26 on the Dolce Hotels and Resorts Facebook wall at www.facebook.com/dolcehotels. Michael Goldrich, Dolce's director of global Web services and e-commerce, noted that this will be the company's second such Facebook contest this year following a successful promotion this summer featuring Dolce's Lakeway Resort & Spa in Austin, Texas. "Our customers love the social media and enjoy interacting with Dolce online in contests like this," he said. The meticulously renovated Spanish Colonial Revival-style Dolce Hayes Mansion, listed on the National Register of Historic Places, is a fusion of high-tech convenience and turn-of-the-century luxury. Groomed lawns and mountain views create a quiet haven for meetings and relaxation just 15 minutes from San Jose International Airport and 45 minutes from San Francisco and Monterey. The hotel's 33,000 square feet of function space, certified by the International Association of Conference Centers, includes 25 conference rooms. Dolce Hotels and Resorts, headquartered in Montvale, N.J., and Paris, is majority-owned by Broadreach Capital Partners and employs approximately 4,000 worldwide. Its portfolio of iconic hotels, resorts and conference centers also includes Lakeway Resort & Spa in Austin, Texas; Dolce Sitges in Barcelona, Spain; Seaview, near Atlantic City, N.J.; Dolce Chantilly in France; and Aspen Meadows Resort in Aspen, Colo.
Dolce Hotels and Resorts has earned a reputation for creating inspiring working and learning environments through its superior cuisine and amenities, productive facilities and design, and dedicated, personalized customer service. Additional information is available at www.dolce.com. A dream vacation at Dolce Hayes Mansion will be awarded in conjunction with the 'Tell Us Your Story Promotion' offered by Dolce Hotels and Resorts.